The older I get the more God has brought many things to my attention that the things of the world that excite most people have no waver on exciting me. If I could pay for peace of mind regarding my adoption experience do you know I would set up a payment plan and pay it off until my dying days? Unfortunately, we all know this is a silly thought to have but truth is if there was anything on earth I would love to pay for this would be it! Can you imagine the investment we could all make in our own lives? The fact of the matter is, when I am 41 years old STILL trying to figure out the truth, still seeking answers, still FIGHTING to seek solace and peace regarding this experience it is one of my biggest goals in life, is to feel peace about being adopted. Sadly, I still don’t have much of my truth yet and have recently found some of what I was told was lies. When I have spent 41 years fighting for the truth, it seems it has over powered SO MUCH OF MY LIFE that I still have yet to really enjoy LIVING! I mean how can we live when we are still trying to figure out who we are and where we come from? I can speak from my experience only, that this life has caused me to REALLY appreciate the SIMPLE THINGS IN LIFE that so many people can take for granted. I follow an adoptive parent on social media and one weekend she spent the entire weekend taking photos of old knickknacks she had around her house that she had collected from her parents, grandparents and great grandparents. It struck a chord with me because I wondered if she knew how valuable even one of those things would be to her adopted children if it was something from their biological families? Did she know most all adoptees are robbed of this simple gift most all non-adoptees get to take part in? Again, it’s not the material value, it’s the sentimental value that each of these things holds. I can speak for myself that I have nothing from either of my biological families. I have nothing tangible that has no material value or anything that has sentimental value. Pictures mean the WORLD to me, but I have very few of them of my biological family, although I am grateful for the ones I have. So many of my fellow adoptees have none! Letters mean the world to me, but I don’t have any from my biological family. They promised they would write but they never delivered. Let me also share MEMORIES hold a special place in my heart. I know most people who haven’t been adopted can’t have such an appreciation for memories that I have. The memories lost forever that can never be replaced cause me more sadness than anyone can ever imagine. And I’m sorry; I can’t just get over it and move on. Every time I see someone on social media post pictures with their biological family whether it be grandparents, parents, siblings or whoever it is a trigger for many of us. It is a reminder that we are somewhere between here and there and those memories are lost forever. While most people are grieving long lost family members when they pass, they have memories to cling onto. Not the adoptee. We have deep sadness because we WISH we had those memories. This has added to me as a person, because my primary love language is QUALITY TIME. My least favorite love language is GIFTS. I think this is a gift in itself because most people that know me know I’m one of the most genuine sincere people they will ever meet. I most definitely won’t use you for your money, and I am clear about what makes me tick. QUALITY TIME WITH THOSE I LOVE. TALKING TO THOSE I LOVE. MAKING MEMORIES WITH THOSE I LOVE. TAKING PICTURES WITH THOSE I LOVE. – It’s that simple for me! THE TRUTH, THE WHOLE TRUTH AND NOTHING BUT THE TRUTH AND THIS IS SOMETHING I AM STILL FIGHTING FOR. MOST PEOPLE DESIRE THINGS OF THE WORLD. THAT IS WHAT MAKES THEM HAPPY. Nicer cars, nicer houses, nicer electronics, nicer clothes, promotions on their jobs, newer clothes, shoes, watches, and the list could go on. I WOULD SIMPLY BE HAPPY AND BE ABLE TO MOVE ON WITH MY LIFE IF I HAD ALL THE TRUTH TO MY HISTORY! I could find myself just as happy living in a one room efficiency apartment as I would a huge 8 bedroom mansion. Because the things I desire money can’t buy! The sweet gift of being an adoptee who keeps things simple and who enjoys the simplicity life brings is a different aspect that most non-adoptees can’t embrace. I consider that part of this life as a GIFT. I don’t have credit cards. I don’t usually make impulsive decisions with money. I get the same happiness from 1 shirt at Goodwill as I do 1 shirt from Macys. My kids make fun of me, but I don’t care. I am the most humble frugal spirited anyone will ever meet because the most important and valuable things that I could have, that most take for granted have been taken from me. I haven’t given up on receiving these things. I still have hope! For my Christian friends who might be reading, yes I believe Jesus paid it ALL! But I also know God wants me to have my truth, and once I obtain the ENTIRE TRUTH regarding my adoption experience I will have that Jesus peace about my entire adoption experience. Today I have Jesus peace in most areas of my life! This just happens to be the area shaded with secrecy and lies. Let’s face it, we can’t give it to JESUS unless we know what we are giving to Him! It’s kinda hard to hand him a question mark??!!! Have you ever thought about that? You can’t possibly thing I would be choosing heartache and pain for peace of mind if it were that simple? God is TRUTH and I know he wants ALL ADOPTEES TO HAVE THEIR TRUTH! Why are so many people in adoption standing in the way and supporting half truths? While I continue on my journey of seeking my TRUTH, I enjoy things that are free. Being outside, being alone with God, listening to worship music, reading my bible, writing, journaling, blogging and reaching out to my fellow adoptees, supporting them in their journeys, being on board for adoptee rights. I enjoy helping hurting people, I enjoy the sky and going to coffee shops, parks, thrift shops, garage sales, bon fires. I love eliminating all negative and toxic people, places and things out of my life. I love plants and colors. I love that I can control that aspect of my life, when so much has been uncontrollable. I love growing in my relationship with God, and my church family. I love spending time with my kids, and my adoptive family who I have relationships with. I love my career of caring for elderly, and find it a major gift in my life. 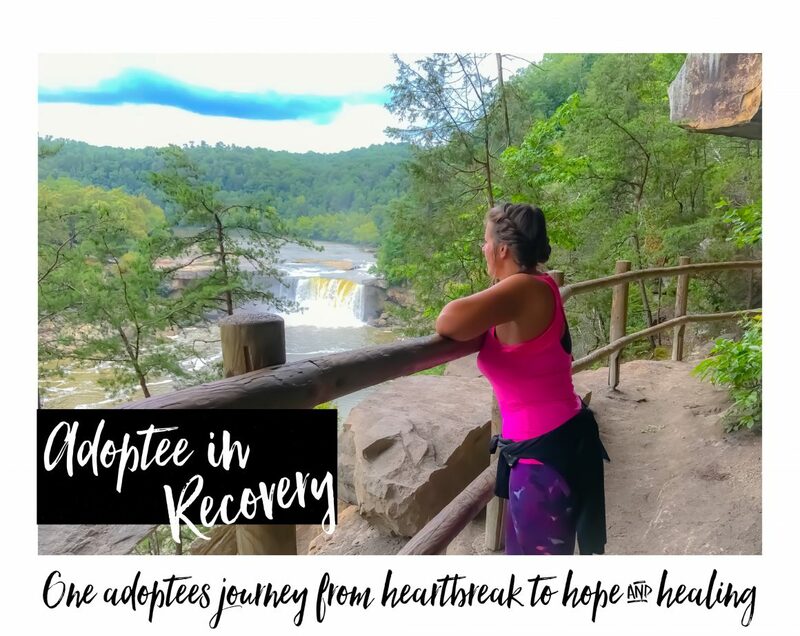 So you see there is more to me than being adopted but this is what God has called me to write about so my fellow adoptees know they aren’t alone like I once felt. If anyone comes into my life and tries to disrupt the peace I do have I have no choice to eliminate them. Because I have no time for relationships or people who do nothing but drain the life out of me. It’s taken me 41 years to get to be where I am. By God’s grace I am able to see the beauty in so many areas but I am still fighting for my TRUTH! I have no time or energy for toxic people! I’m wondering if any of my fellow adoptees can relate to anything I have shared in this post. What brings you happiness? What brings you peace of mind? What are you fighting for most people would take for granted? If you haven’t joined our online community please join today! Add me to your Facebook! Send me an introduction! I love connecting with my fellow adoptees!